High volume conformal plating production in Uniplate® InPulse 2 equipment: Inpulse® 2HFU is masking drilling defects and provides reliable coverage of wedge voids thanks to its superior throwing power in BMVs. The process is the ideal solution for reliable mSAP flash plating. 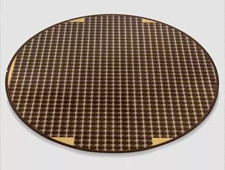 Inpulse® 2HT assures best plating uniformity in through holes with significantly improved surface plated copper distribution, comparing high and low hole density areas. The latest version of Atotech’s Cupracid® TP series: Cupracid® TP3. This is an electrolytic copper plating process for conventional hoist type DC equipment using soluble anodes. It provides outstanding throwing power at high current densities and low surface tension for the comprehensive wetting of BMVs and through holes. Cupracid® TP3 offers excellent reliability results. It is a very robust process with stable plating performance after idle time. Cupracid® AC is for conformal copper plating with soluble anodes. It provides excellent throwing power in both BMVs and Through Holes at high current densities. Cupracid® AC is compatible with a wide range of vertical conveyorised systems with sparger electrolyte agitation as well as hoist type equipments with air agitation. Cuprapulse® XP7 for soluble anode systems is our pulse plating solution for high aspect ratio conformal copper plating. DC technology does not even come close to the throwing power performance achieved with Cuprapulse® XP7. High current density pulse plating allows for increased productivity with simultaneous quality improvements such as better surface distribution and line shape. Horizontal BMV Filling: Inpulse® 2HF provides outstanding BMV filling performance (Superfilling®). Superlative BMV filling results with minimum surface plated copper will be achieved. Thus the use of Inpulse® 2HF in the unique Uniplate® InPulse 2 System in combination with the Atotech Fe-redox Cu replenishment system is ideally suited and proven for high end and high volume HDI production. 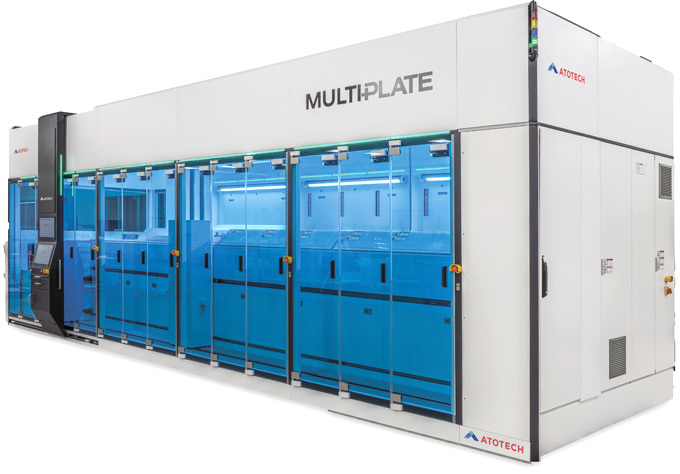 Atotech’s latest development, Inpulse® 3MSAP, in combination with the new Uniplate® InPulse 3 equipment offers pattern BMV filling at excellent panel surface distribution. The process is dedicated for (a)mSAP production at highest current densities and provides outstanding rectangular line shape. Vertical BMV filling: InPro® MVF and InPro® MVF2 are the VCP processes for current and next generation HDI BMV filling. They are designed for use of insoluble anodes in DC mode and provides excellent pattern BMV filling without dome plating at minimum plated thickness. Our mass production proven InPro® THF is not only capable for through hole filling but is also a high current density pattern BMV filling process in VCP systems with insoluble anodes. It is the reference for mSAP applications. It’s successor InPro® THF2 offer greater filling capabilities, higher uniformity and increased ductility especially for amSAP production. 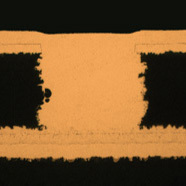 Inpulse® 2THF together with the unique Uniplate® InPulse 2 horizontal reverse pulse plating systems is ideally suited for through hole filling , especially for core material with a copper foil of less than 5 µm thickness. Inpulse® 2THF grants reliable and inclusion-free copper through hole filling combining patented X-plating and Superfilling® technology in one process chemistry achieving lowest possible surface thickness. InPro® THF is a filling electrolyte for laser ablated through holes (LTH) in VCP facilities for IC Substrate production. The DC plating process is running in mass production in VCP equipment worldwide. It’s successor InPro THF2 offers increased filling performance and uniformity. Both may also be used for pattern BMV filling at highest current densities for (a)mSAP production. Nikotron®: Assures a soft, ductile and low internal stress nickel deposits. Stress level and hardness can be controlled. Aurotron®: An electrolytic gold plating for wire bonding and soldering as well as for hard gold applications. Pallatron: Provides an electrolytic palladium deposition for higher reliability and reduces costs for Ni/Pd/Au applications. 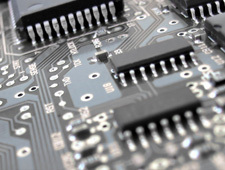 SolderFill®: A high-speed Electrolytic Tin Solder Depot Plating which overcomes the limitations of solder paste printing and Micro-ball placement. 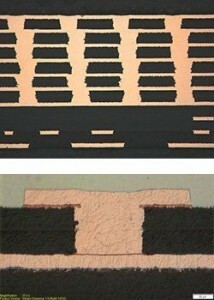 StannoBond®: An electrolytic tin plating process for Solder on Copper Pillar and for Thermo Compression Bonding. The new Innolyte® product family for electrolytic plating is paired with an innovative equipment technology for electroplating, the MultiPlate®. Our high purity Innolyte® chemistries are designed to plate RDL structures and pillars at highest current densities while achieving excellent uniformity of the plated structures. The plated copper is of high Cu purity to ensure highest copper properties and reliability. CupraPro® S8: A biodegradable pre-treatment for all HDI panel and pattern copper plating applications. It grants excellent cleaning and also low dynamic surface tension for optimum wetting with reduced drag out. CupraPro® MV: A biodegradable pre-treatment product for IC Substrate plating applications, specifically developed for use in vertical hoist type equipment. It is NPE free and grants fast, effective pre-treatment through its low dynamic surface tension for via filling applications with reduced drag out. CupraPro® VC: A new acid pre-treatment product for all panel and pattern copper plating applications, specifically developed for use in vertical conveyorized equipment. It grants low foaming in turbulent fluid environments and rapid, effective wetting of all structures, especially high aspect ratio through holes and BMVs. The unique Uniplate® InPulse 2 System and processes are ideally suited to meet all demands for high end production using pulse plating at high effective current densities with insoluble anodes. 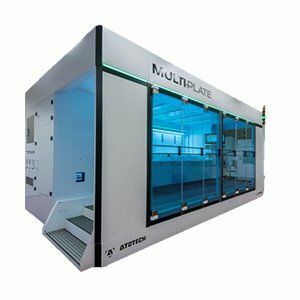 MultiPlate® is the ECD tool that offers the versatility and multifunctionality necessary to tackle current and future challenges for optimal performance in advanced packaging technologies. The MultiPlate® P system is designed for Panel-Level-Packaging and capable of processing panels up to 650×610 mm. Innolyte® P – high purity copper pillar plating at current densities up to 20 A/dm² for best uniformity and no voiding in IMC. Atotech offers Copper filling solutions not only for our unique Uniplate® IP2 system but also for VCP and hoist type systems as well. BMV filling is achieved with low surface copper plated in panel and pattern plating. Through hole filling is available in panel plating inclusion free for horizontal equipment and in pattern plating for vertical conveyorised systems. This article was created in cooperation with GreenSource Fabrication LLC., USA and was originally presented on IPC APEX EXPO 2019. The paper describes the reasons for development of copper via filling and a roadmap of dimensions for copper filled through holes, microvias and showing aspects of other copper plated structures on PCBs. 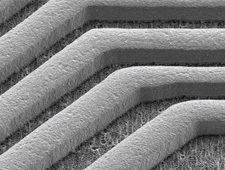 Furthermore, it contains feasibility studies of new electroplated structures for future applications such as copper pillar plating on IC-substrates. 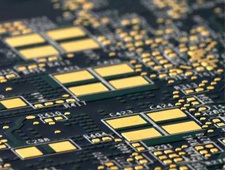 The ever increasing demand of higher performance, lower cost and thinner end user devices like smartphones require intense developments and innovation in all areas of the electronic component design including the substrate and chip packaging. 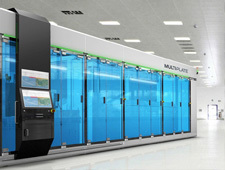 Latest manufacturing technologies in both areas like fan-out wafer level packaging and advanced substrates are constantly emerging and promise to be a critical piece to meet these requirements. The paper presents latest studies and conclusions in critical performance areas of the plating process such as electrolyte fluid dynamics, impact of anode design, pulse reverse rectification and newly designed electrolytes on panel sizes of up to 600 mm. This article was was originally published on IMAPS 2018, Pasadena. The Semi Additive Process (SAP) has gained more attraction over the past years because it enables very fine lines and spaces for the production of IC-substrates. 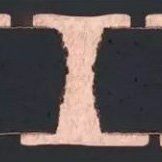 When operating with lines and spaces (L/S) of 10/10 μm and less, the copper thickness variation is one of the critical parameters which has to be controlled within a tight range in order to avoid reliability problems in assembly or during the lifetime. This paper contains the results of our investigations on our latest via filling process for IC-substrates with regards to copper thickness variation (WUD), dimple results, filling performance and microsection pictures. This article was was originally published on EPTC 2018, Singapore. 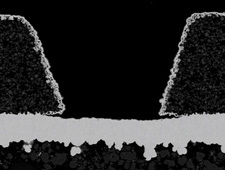 This paper presents the complete through hole filling for cores using a Cu electroplating process for IC Package production, especially for FC-BGA and FC-CSP. In detail the influence of electrolyte agitation, current density, inorganic and organic concentrations on the filling performance are described and discussed. The result of our investigations is a process with improved TH filling capability at low void occurrence and excellent within-unit distribution. The article was was originally published on SMTA 2017, Chicago.